After eating my share of crow over Milwaukee tools I didn’t think I’d like (see the fastback knife), I’ll try not to stick my foot in my mouth over this one. 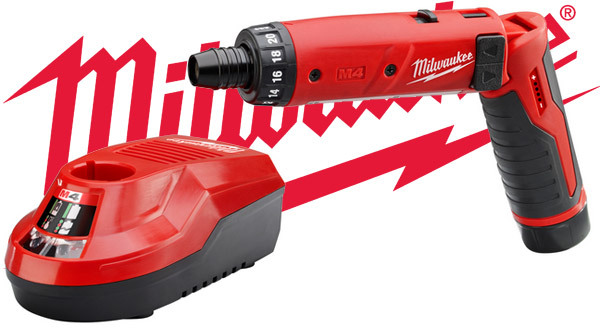 Milwaukee doesn’t spend cash and time building tools they think will fail. If they say their M4 cordless screw driver is aimed at manufacturing gigs and tradesmen, where the same small job like turning screws is a requirement, we won’t argue. I would suggest that I’ve never seen Milwaukee go to battle without a plan in the last six years, and that this tool is just the opening salvo for the M4 line. The screwdriver itself doesn’t really exude the charm or innovative spirit that the M12 drill did. It’s, well, a screwdriver. It looks the same as the drivers you’ve seen hanging on shelves since the 90’s. Of course the folks in red and white have upgraded it to sport 44 in-lbs of (peak) torque, 21-position clutch, 2 speeds (200 and 600 RPM), Milwaukee’s own gen-2 Red Lithium battery system, and a 1/4” quick-change chuck. They proclaim it can “drill more than 200 holes per charge” — though into what and with what sized hole aren’t in the specs. We’re sure it’s a good cordless screwdriver, but we really don’t need one when we’ve got an awesome 12v Li-ion drill/driver in the drawer already. Some people will dig it, but the platform is what sounds like the real winner. What they’ve done is create a base for a micro tool line that focuses on precise jobs that require super lightweight and long battery life. More than anything else, that is exciting to us. I have an old version of this tool. It was much better made than the equivilant craftsman screwdriver, but it is so underpowered and slow that it never got used. Mine was a gift, which got little use. Mine had a 1/4″ jacobs chuck that you could insert in the end. I pulled the chuck and use it for odd sized bits in my m12 impact driver. I also have the original version of this tool. I loved mine. It was great for machine screws and short wood screws for hinges and drawer slides. I’m certainly considering a new one. When do we get the multi-bay M12 charger? I wanna have so many M12 tools, but I don’t have the space for 5 separate corded chargers…. I have a whole bunch of the older version on my factory line. They work great for screwing in a crap-ton of fasteners and using a real torque driver to do the final torquing. Depending on the price, it might be a handy item to have. Work in electronic product development. Absolutely love the older version of this tool. Mainly cause of the clutch and the torque. You can’t use a regular driver when your product is smaller than a 24V battery pack and you have to take apart 100. I wish they made a charge cradle for the entire unit rather than a battery charger. I have the craftman version of this tool. I love it. It has lots of torque because of its impact capability. The only draw back is it size (Large). I don’t think craftman sell the version I have anymore. For about a year and a half I used the 1st, 2.4 volt, generation of this tool when repairing navigation systems in automobiles. Replacing hard drives and motherboards in small electronics, I picked this device up to a hundred times a day. I used the chuck fairly often to adapt precision bits where 1/4″ hex could not suffice. The speed was fantastic and the torque was great. I have an M12 drill if I want to hang a door but when I work on computers and electronics, this was THE tool to use. I’m really looking forward to the usage of the M4 battery system. I’ve already pre-ordered.